In an interview with The Guardian at Mobile World Congress, Shazam’s executive vice president of marketing David Jones shared some more useful stats on that front, as well as on where Shazam is making its money in 2013. Starting with the active users – or audience, as Shazam’s TV partners may see it. “We don’t publish our monthly actives, but I can say that weekly actives are in the tens of millions, and monthly actives are many tens of millions,” says Jones. It’s this scale that’s important to Shazam’s expansion into the second-screen TV space, where apps designed to complement TV viewing like Zeebox and GetGlue are still counting their downloads in millions. Shazam says its users are currently tagging 10m songs, shows and ads a day. They’re also tapping through to buy the content they tag from download stores like iTunes and Amazon MP3 – to the tune of a run-rate of $300m of sales a year. The vast majority is music, but TV shows, films and apps are a small but fast-growing percentage. It’s that second-screen TV business that holds the key to Shazam’s future, though. Starting in the US, which accounts for 90m of those first 300m users of the company’s app. Shazam creates content within its app for every programme on 160 American TV channels, serving it up when viewers tag the show. Content? That’s a mixture of episode descriptions, quizzes, tweets, cast information and playable clips of every song on the soundtrack, with links to buy song downloads, TV episodes and merchandise – the latter through a partnership with e-commerce firm Delivery Agent. For big events like the Super Bowl, Grammys and Oscars in the US – and recently the Brit Awards in the UK – Shazam builds what Jones calls “custom experiences”, with polls, predictions, and video highlights for 2012’s Olympic Games, with official US broadcaster NBC. The custom experiences side of Shazam’s business has just been boosted by Fox Broadcasting Company’s launch of an initiative called Fox Now, in partnership with a firm called Watchwith. The scheme involves providing second-screen apps companies with extra material to synchronise with shows as they air. The idea: Fox will provide behind-the-scenes footage, interviews, interactive content and ads to a range of third-party apps. Shazam is one of four launch partners in the US, alongside Viggle, ConnecTV and NextGuide. Fox’s second-screen content won’t be exclusive to Shazam, though. Jones is nevertheless bullish on the threats posed by these rivals and others including Zeebox and GetGlue. “They’re all struggling to get downloads. If they’re getting a couple of million downloads, they’re lucky. And while it’s great that they’re trying different things, they haven’t nailed the experience: nothing has taken off,” he says. How does that translate into money? Sponsorships and ad-tagging. In the former case: “We get six-figure sponsorships for single-night events, and some seven-figure sponsorships over a broader spread of time,” says Jones. In the latter case, brands pay Shazam to make their TV adverts interactive: they include a call-to-action in the ad to get people to tag it, and then Shazam provides second-screen content relating to their campaign. The company has run more than 200 campaigns for over 140 brands, according to Jones. “The minimum price is $75k, but most cost between $75k and $200k for a campaign that runs for a couple of months,” he says. Or get bought, of course. Shazam’s openness about its revenues and growth is clearly partly about drumming up interest from broadcasters and brands outside the US, but it won’t hurt any long-term ambitions for the VC-backed company to find its exit. In the meantime, Shazam is continuing to bulk up its salesforce, plot global expansion for its TV business, and steering clear of some of the pitfalls that lie in wait. For example, Jones says Shazam won’t get sucked into letting networks or advertisers target their rivals through its app – for example, enabling Coca-Cola to pay Shazam to show its content when someone tries to tag a Pepsi ad. The company isn’t abandoning music – it recently inked an exclusive deal with dance-music downloads store Beatport to bolster its database of electronic music, and has been building second-screen content for music videos by Ellie Goulding, Lil’ Wayne and Mariah Carey / Justin Bieber, for example. 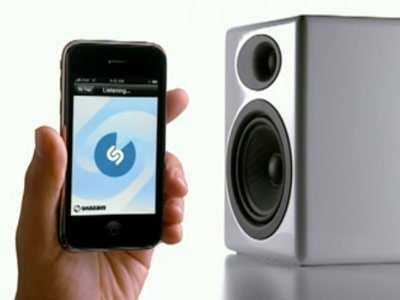 Shazam is also releasing a new version of its iPad and Android tablet apps, with an emphasis on discovery. People can see which shows and songs are being tagged most by Shazam’s users around the world, and drill down by country, city and town through a map interface. “The whole idea here is to build a better experience on your lap,” says Jones, while showing off the new app, which will be released in the coming weeks. Shazam is hoping that beefing up its tablet experience will boost its longer-term ambitions to make second-screen advertising an even larger business. “For the time being, second-screen is supporting the ads on the first screen, but there will come a time when second-screen revenues start to become significant enough that the television networks and advertising sales groups will really start to take notice,” says Jones.